I’d never heard of Lausanne or Lac Léman until I received an invitation to join a small group of bloggers in discovering this Swiss gem. Over the course of three days, we’d taste our way through Lausanne, and explore its top sights along the way. We’d also have the chance to experience its unique summer festival, Festival de la Cité. I quickly learned that Lac Léman was simply the French name for Lake Geneva – locals hate the name in English as “the lake is for everyone, not only those from Geneva”. Though looking back at history it seems the lake was actually once called Lac de Lausanne in the middle ages. But when nearby Geneva grew in power, it became Lac de Genève. In the 18th century, the French speakers of the region settled on Lac Léman – and it seems the least offensive choice to me! From Madrid, Lausanne is only a quick two-hour flight and 35-minute train ride from the Geneva airport. I was shocked how quickly I could go from Madrid’s unbearable July heat to Lausanne’s clean mountain air and views of the alps. Lausanne is a stunning city – the first thing you’ll notice is the postcard-perfect views of the mountains. Combined with the enormity of the lake (one of the largest in Western Europe) and bright green trees, it immediately made me question my decision to live in Spain’s dry capital. But comparisons aside, a visit to Lausanne is an incredible way to spend a weekend (or longer!). Accessible, stunning, and filled with things to do (and eat), this is my kind of city and I suggest that you add it to your travel wishlist too! Need more reasons to visit? Here are my top six reasons to visit Lausanne. The memories of Lausanne that will last me a lifetime are the views. The sprawling lake and towering alps are simply stunning. It’s the kind of view that immediately relaxes you — a view that inspires poets and artists. My mind wandered to what it might be like to live in Lausanne and to wake up each morning with that view. How it might feel to take a daily walk or bike ride with the view… one can dream! But honestly, this trip made me crave nature in a way I never have. I was always the girl raised in a rural farm town who dreamed of escaping to a bustling city. And I did just that — but here, suddenly I was fantasizing about another life. The grass is always greener — sometimes literally! For the best views in Lausanne, book a hotel that looks out over the lake. We stayed in the beautiful Hotel de la Paix, which has stunning views from its spacious balconies. I would wake up and pop outside every few minutes to see how the light changed the landscape as the sun came up. If you don’t have views from your hotel, however, don’t worry. Simply head to the city center and go to the Cathedral of Notre Dame of Lausanne. Right in the center of the pedestrian-friendly old town, the lookout point right in front of the cathedral is one of the best spots to sit and admire the lake and mountains. The cathedral is worth a look as well – constructed in the 12th century, it’s stunning (and home to a 6 million dollar organ made in Boston!). And if you really want amazing views – incredible, once in a lifetime views – you need to take a helicopter ride. We flew over Lausanne with Heli-Lausanne, a small company offering a variety of activities in the air. Our flight took us on a 20-minute ride over the city and the Lac Léman, and then over the beautiful Lavaux vineyards – a UNESCO world heritage site! The company also offers a trip that takes you for a fondue picnic in the mountains– I’ve saved that for next time! Heli-Lausanne was so much fun! In the end, Lausanne is all about the lake. The city offers beach areas, and lakeside bars and restaurants, paddle boats and eco-cruises. There’s also a long walking path along the lake that locals use for biking and jogging. We decided that to best experience the lake we would need to get on a boat, so we went out on a lovely solar powered boar for a couple of hours. I love the idea of eco-boats and this one was perfect. The captain even gave us time to go for a swim, and while I decided to keep dry (I had my flight later that day), I was envious of the others! When we met our local guide, David, the first thing he said was that Lausanne is known for three things- chocolate, wine, and cheese. As you can imagine, I was sold from the start! But I was actually really surprised at the variety and quality of food options in Lausanne. As a city of about 150,000 people, it has its own street food festival, food association, farmer’s market, and plenty of great restaurants, chocolatiers, wine shops, and gourmet stores. My two favorite food experiences in Lausanne were a chocolate making workshop and a fondue dinner at the city’s oldest restaurant. We visited L’Espace Chocolat the first afternoon only to be put to work. After a short history of Swiss chocolate (did you know that Henri Nestle invented the milk powder which was later used to create the first milk chocolate?! ), we put on our aprons and rolled up our sleeves. The hardest part of the class? Deciding between milk and dark! We tempered the chocolate to the perfect temperature and then piped it into small disks and other more “creative” shapes. We then decorated with nuts and dried fruit. At the end, we took our treats home (though they didn’t all make it back to Madrid!). We also had dinner at Lausanne’s oldest restaurant, Pinte Besson, where we feasted on Swiss cured meat followed by a classic cheese fondue. I’d tried fondue a couple of times before, but never like this. We ripped our bread into small pieces and dunked the chunks in the bubbling bowl of cheese. The flavor was amazing – a mix of gruyere and raclette, garlic, and white wine – I proceeded to overdose on bread and cheese and then David insisted we digest with the house dessert – swiss meringues and thick whipped cream. Why not? Pinte Besson – Lausanne’s oldest restaurant! And of course Swiss meringues for dessert…! Not much Swiss wine makes it out of the country (only about 1% is exported– and mainly to Germany!) and it definitely doesn’t often make it to Madrid! That’s because locals know they’ve got something special, especially in the area surrounding Lausanne. The nearby Lavaux vineyards are among the few UNESCO world-heritage vineyards in the world. Stretching for about 30 kilometers along the shores of Lac Léman, these terraced vineyards are gorgeous. They grow mainly the Chasselas grape and all grapes are hand harvested. The wines they produce are steely whites, perfect with a variety of local dishes. This was our wine of choice throughout the trip, and I’m still kicking myself for not bringing a bottle back! When I heard that Lausanne was the world’s Olympic Capital, I wasn’t quite sure what that meant. Home to the International Olympic Committee (since 1915!) I thought it was an interesting fact, but didn’t think much more of it. But it turns out that the city explains it all at the Olympic Museum, and it’s the number one thing to do in Lausanne for a good reason! The track to channel your inner Olympian! We visited one morning for a couple of hours and the museum is excellent– modern, interactive and filled with experience enhancing technology. I started in the free exhibition about branding the Olympic games (which was fascinating) and then headed into the museum’s permanent exhibitions, which gave the history of the games, and plenty of torches, costumes, and apparel to admire. I’d highly recommend a visit – and afterward, stroll along the lake for pizza and beer at Lacrustre restaurant. Another place with a stunning view! One of the reasons we were visiting Lausanne in summer was to experience their yearly summer festival called Festival La Cité. This event is put on by the city and local sponsors and attracts talent from all around the world. Musicians, singers, dancers, and actors put on over 90 shows spread over six days. The cost of the festival? Totally free! The La Cité festival is incredible! I was stunned at how amazing this festival was and would go back again just to attend. The whole city center was closed off to traffic and different size stages were scattered throughout a radius of about a kilometer or so. You might walk into an intimate piano concert and then turn the corner for a rowdy rock band or a Brazilian dance troupe. 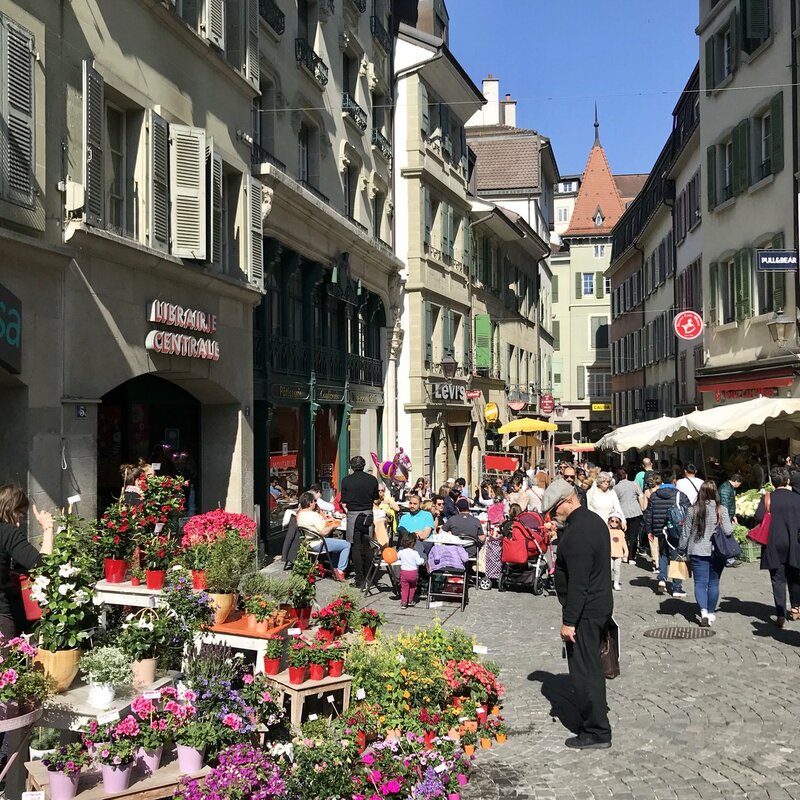 The vibe here was relaxed and happy– as Lausanne is a popular student town the festival goers were often on the younger side (teens, 20s, and 30s), but you saw people of all ages (from toddlers to the elderly) enjoying themselves. One of the cool foodie initiatives during the festival is called the chef’s table. Each night of the festival about 20 people dine right in the center of the action, with local restaurants taking turns playing host. We were lucky to have dinner here one night and loved the experience of sharing a meal with the locals (they were all very proud of their city!). Lausanne was a total surprise and I am so happy I had the chance to experience this wonderful city. I will definitely be back for Festival de La Cité, and to visit the Lavaux vineyards for their open cellar days! I would also love to venture into the mountains when I return. Having lived in Europe for nearly ten years now, I am starting to forget just how much is accessible in only a few hours. I still can’t believe I was staring at the alps in less than three hours from Madrid. I can’t wait to return! Have you been to Switzerland before? Where? Check out the Lausanne tourism website for more tips on visiting Lausanne, things to do in Lausanne and where to eat in Lausanne – it’s a great resource! The first time I laughed was at the dinner table. I was only a couple months old, and my Italian American family was crowded into a small Brooklyn apartment, on the seventh course of Christmas Eve dinner. My great Aunt Carmela slammed her hand down on the table, and I began to giggle. I like to think of that moment as the beginning of my lifelong love affair with food.